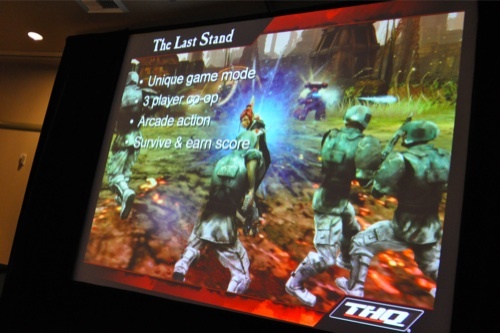 We broke the news last month that Relic would be unveiling their new co-op mode called The Last Stand at PAX 2009 this year. Co-Optimus was there as Relic opened the curtains to the three player add-on for their game. 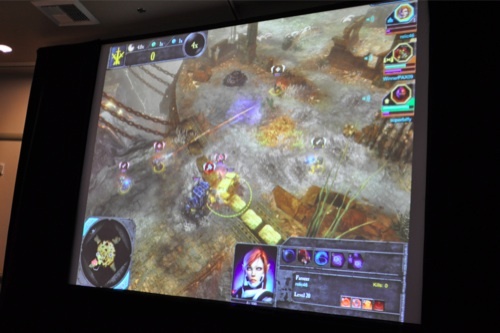 The mode can best be described as a survival mode with persistent progression and a focus on scoring for three players in co-op. Relic had a few goals in mind when designing this game mode. They wanted it to be easy to play, contain short fun sessions, and have a means to success while playing. You choose between a Space Marine, Eldar Farseer and Ork Mekboy and equip them with wargear that you earn from earning XP from playing The Last Stand. Any mix of heroes may be used while playing, so you can have all space marines if you wish - though the races do compliment each other in some way. There's some time before battle to scope out your friends items and decide on the best strategies. One downside of the mode is you ARE required to have all three player slots filled. If you don't have two other friends to join Games for Windows Live can fill in any vacancies. There's only one map available with 20 waves to get through, every fourth wave unleashes a boss character or some other surprise. One of these surprises we saw was a doppleganger fight between the three heroes. Once you reach level 20 you have the option to keep playing to continue earning XP or you can trade in and get an elite status star. For each one of these you'll earn a unique item and a character reset. Some of the more advanced powers we saw involved calling in a Dreadnaught AI pet to help clear baddies as well as an impressive shockwave blast from the Farseer. From what we saw there was plenty of action, lots of scores and points floating around. There are choke points you can hold on the map to earn extra multipliers, and the faster you kill waves the higher your multiplier is. At the end of a session you'll get an individual score and a team score and be notified of any unlocks you may have earned. There will be leaderboards for the game mode as well for those special bragging rights. Overall The Last Stand looks really impressive, and the boys at Relic are targeting a October 14th release date. The price? FREE. Unfortunately that means no extra achievements because Microsoft won't let you add achievements to free content. Either way it's something we are looking forward to. Enjoy some exclusive footage of the game in action straight from the panel! Dawn of War 2: The Last Stand Co-Op Night and Contest!